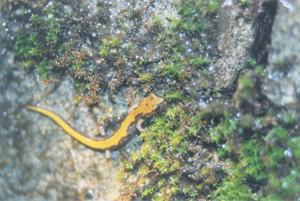 Physical Characteristics: Small, slender salamander reaching 2 – 4 inches in length. Has grayish-black ground color with dorsal stripe of yellow or gold running length of body, and yellow patch on throat. Two forelimbs have four short toes each; hind legs have five toes each. Part of Plethodontidae salamander family; defined by lack of lungs. Breathes through skin and tissues lining mouth. Another distinction is vertical slit between nostril and upper lip known as naso-labial groove. Groove is lined with glands that enhance salamander’s reception of chemical stimuli in environment. Diet: Feeds on insects, millipedes, mites, spiders, snails, and segmented worms. Habitat: Found in 3 major habitat types: springs/seepages, waterfall spray zones, and stream edges. Often associated with fractured rock formations. Prefers moist talus, seep and splash zones, which may be situated in open forest, meadows, or riparian areas; generally well-shaded, north-facing slopes. In wet weather also slinks in leaf litter and under bark and logs in coniferous forests. Eggs are deposited terrestrially, which may occur in similar habitat under rock or ledge, though no nest sites have been found in wild. Range: Some capture/sightings have occurred in western Montana and southeastern British Columbia; majority has occured in northern Idaho – St. Joe and N. Fork Clearwater basins, and Selway, Moyie, and Kootenai River drainages. Lack of research/rarity of sightings and/or capture, has resulted in incomplete population trend data. Research does indicates however that Clearwater populations are more genetically diverse/unique. Three genotypes for species – (1) Selway, (1) Lochsa, and (1) N. Fork Clearwater/elsewhere. This suggests species was previously limited by glaciation to Clearwater Basin during last ice age, and populations in/around N. Fork Clearwater repopulated areas to north after glacial retreat. Reproduction: Generally mate above ground in late summer/fall, and to lesser extent in spring. Hourlong courtship ritual results in male depositing sperm which female picks up and stores up to nine months before fertilizing and depositing eggs; eggs are un-pigmented, grape-like cluster of six on a single thread. Young emerge from underground in September, and reach sexual maturity in fourth/fifth year. Males breed every year; females have biennial reproductive cycle. Threats: Populations vulnerable to highway construction, especially at elevations, and in forest types where timber harvest is common. Population monitoring and data spotty at best; needs to be done more thoroughly, as both a regional amphibian-monitoring program, and as part of habitat protection and water quality efforts. Listed as Sensitive Species in both Idaho/Montana. Miscellaneous: Named after Lake Coeur d’ Alene where it was discovered in 1939. Since it breathes through skin, susceptible to moisture loss through evaporation and therefore restricted to cool/damp environment. Generally comes above ground at night (when temperatures above 45 degrees F) to feed on nocturnal invertebrates. Emerges from hibernation in late March and active near surface through April/May; surface activity is negatively correlated with daytime temperatures and number of days since last rain. Creatures retreat to cool underground to aestivate from June/September – a state of dormancy where the body is inactive and metabolic rate drastically lowers in response to high temperatures and arid conditions. Aestivating helps Coeur d’Alene Salamander avoid drying out and being damaged from high temperatures.